Hearthstone HCT Oakland Tour Stop was played from 14th July to 15th July 2018 at Esports Arena in Oakland, USA. It was an open Hearthstone Championship Tour Stop, where 158 players competed for a $15,000 USD prize pool and HCT points. The event was played in a best-of-five Conquest format with one ban. It started with 9 rounds of Swiss followed by a top-8 cut into single-elimination playoffs. For a relatively old meta, there have been lots of changes from the previous week. Druid remains the most popular class, but it had to share the top spot with Warlock, which bounced back with surprising strength. Behind the top duo, there were also lots of changes. 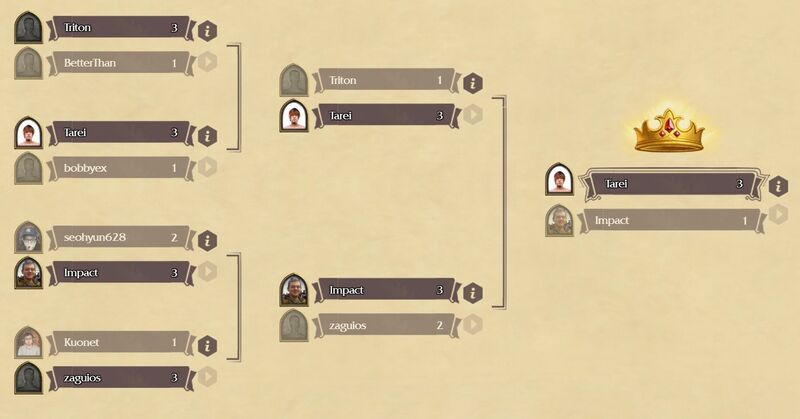 Warrior and Priest, classes that were at the bottom at HCT Italy one week ago, suddenly jumped up to fourth and fifth place at the expense of Paladin and Shaman. Furthermore, both Warrior and Priest were in several top-8 lineups. Druid remained the most popular class. Alas, this time it was forced to share the top spot with Warlock, both being brought by 132 players. Similar to what has happened to it multiple times on the ladder, Taunt Druid crashed, and it crashed hard. From the most popular Druid archetype at HCT Italy to number four at HCT Oakland. The archetype can be very powerful, but it has inherent weaknesses and is easy to target. Against an unsuspecting field, it can dominate, but when it is expected, it cannot find solid ground. Nonetheless, one of the 13 Taunt Druid managed to reach the top-8. The new druidic top dog, as expected based on HCT Italy, was Malygos Druid. 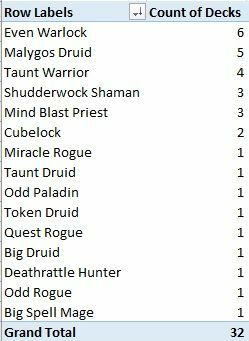 61 Malygos Druids entered, five of them made it to the top-8. That is one dominant performance. Did Malygos Druid still have the element of surprise? Shouldn’t ladder results and HCT Italy have resulted in people being prepared for the deck? Time will tell whether Malygos Druid is simply too powerful to be contained. The other popular Druid archetypes were Token Druid (32) and Big Druid (18). One player reached the top-8 with each. Overall, Token Druid lineups did not perform that well while Big Druid was above average. Neither was able to match the dominance of Malygos Druid, though. Warlock had been on the way down, but it bounced back to share the top spot with Druid. Even Warlock continues to be the most popular individual archetype, this time it was brought by 81 players, six of whom reached the top-8! From sub-par performance at HCT Italy, Even Warlock bounced back to an above-average performance overall while being hugely popular. In addition to Even Warlock, there were also 25 Cubelocks (two in the top-8), 22 Zoolocks (each one of them a Heal Zoo), 3 Control Warlocks, and 1 Howlfiend Warlock. As in Italy, Control Warlock was a high performer that nonetheless could not reach the top cut. Cubelock performed very well, while Zoolock – a ladder phenomenon as of late – crashed and burned in its first major outing in a tournament. Rogue lost some ground, but it was still the third-most popular class. 36 Odd Rogues led the way, joined by 25 Miracle Rogues, 3 Quest Rogues, 1 Tess Rogue, and 1 Tempo Rogue. One of each Odd Rogue, Miracle Rogue, and Quest Rogue reached the top-8. Overall, both Odd Rogue and Miracle Rogue lineups performed below average, while Quest Rogue lineups had a good tournament. Warrior jumped in popularity and performance. 61 Taunt Warriors (four in the top-8), 2 Control Warriors, and 1 Odd Control Warrior entered the tournament, and this time Taunt Warrior had a solid performance all around. Priest was not popular at HCT Italy, but it performed very well there, prompting expectations for its popularity to rise. It did indeed! 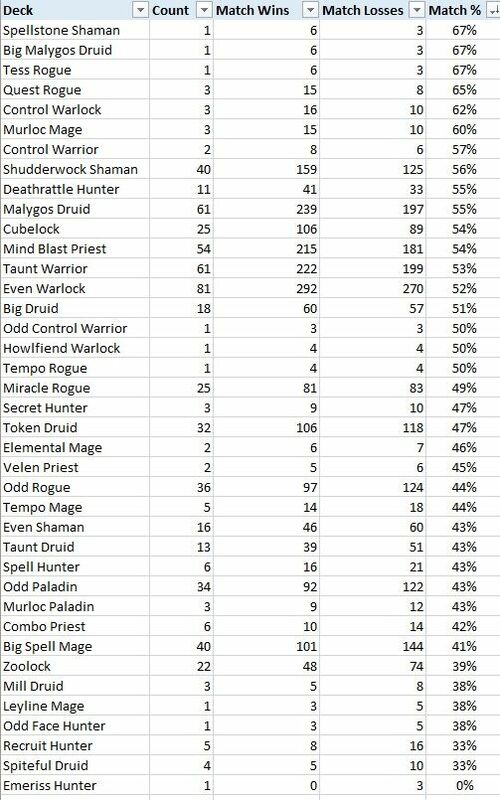 The share of Priest decks in the tournament doubled, and the large majority of them were Mind Blast Priests (54, three in the top-8). Mind Blast Priest lineups in general continued to perform very well and Combo Priest lineups (there were six) failed once again. Shaman was disappointing at HCT Italy, and many players opted to not bring it to Oakland. Surprisingly enough, three of the 40 Shudderwock Shamans made it to the top-8 and Shudderwock Shaman lineups in general performed very well in the tournament while Even Shamans (16) struggled – a complete reversal of the fortunes of the two archetypes compared to Italy. There was also a Spellstone Shaman in the tournament. You know, with Snowfury Giants, boom, a big board of Giants and you’re about to die kind of thing. The lineup, brought by Quachie, ended up going 6-3 and getting a top-32 finish. A lot can happen in Hearthstone. Mage was mediocre in Italy and it did not get any better in Oakland, quite the contrary. One of the 40 Big Spell Mages made it to the top-8, but Big Spell Mage lineups were at the very bottom of performance in the tournament overall. Tempo Mages (5) could not find their groove either. The only somewhat successful Mage archetype was Murloc Mage (3), but they did not peak high enough. Paladin was not a popular choice at Oakland. Its declining ladder performance has given cause for concern and, indeed only 34 players brought Odd Paladin and three players brought Murloc Paladin. Neither archetype found much success, but at least one Odd Paladin made it to the top-8. Interestingly enough, Even Paladin was nowhere to be seen. The archetype made a small comeback at HCT Italy, but it performed on a mediocre level and no one brought it to Oakland. With the meta still changing, it is worth considering whether there are ways to incorporate Paladin into a tournament lineup. Hunter found itself at the bottom. The Recruit Hunter build with Kathrena Winterwisp and Seeping Oozeling has not found lasting success, and while five players still brought it to Oakland, it was completely outclassed by the faster Deathrattle Hunter that runs Devilsaur Egg and Terroscale Stalker – one of the 11 such decks even managed to reach the top-8. Looking at the overall performance of archetypes, the winning streak of Malygos Druid shows no signs of slowing down still. Other popular archetypes that were in well-performing lineups were Shudderwock Shaman, Deathrattle Hunter, Cubelock, Mind Blast Priest, Even Warlock, and Taunt Warrior. Meanwhile, Odd Rogue, Even Shaman, Taunt Druid, Odd Paladin, Big Spell Mage, and Zoolock found themselves at the bottom. The best-performing popular lineup was Malygos Druid – Even Warlock – Mind Blast Priest – Shudderwock Shaman with a 72% win rate. The remarkable thing, however, is that the most popular lineup in the tournament, Malygos Druid – Even Warlock – Mind Blast Priest – Taunt Warrior, brought by 12 players, was also one of the most successful ones with a 63% win rate. Usually, the most popular lineups end up squarely in the middle performance-wise, so such dominance was unexpected.